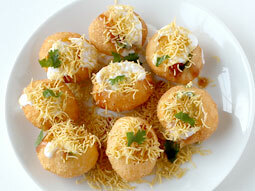 It’s hard to find anyone who doesn’t like to enjoy chaat! 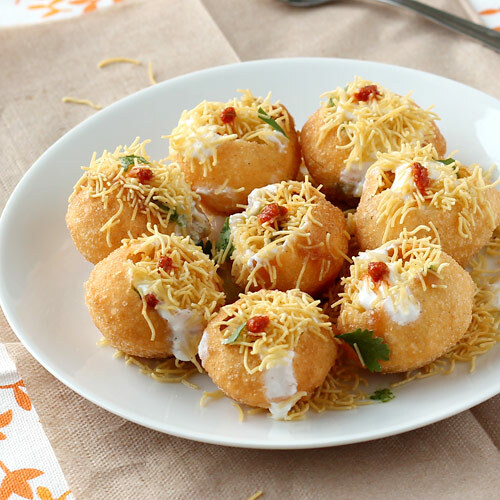 Dahi Puri Chaat is yet another member of popular Indian street chaats that is made by stuffing crispy puffed puris with boiled potatoes and topping it with a combination of sweet, sour and spicy chutneys, onion, sev and beaten curd (dahi) giving it a perfectly balanced tongue tickling taste. It is perfectly suited as a party-snack as it can be easily prepared in large quantities, ingredients can be prepared in advance, just needs assembling at the time of serving and guests can customize it to their taste. 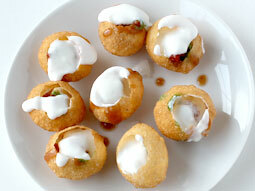 This step by step photo recipe of Dahi Puri explains how easy it is to make it at home. Prepare Sweet Chutney, Green Chutney and Garlic Chutney, by following their recipes. Mix 1-teaspoon garlic chutney with 1-teaspoon water to dilute it. Keep all other ingredients ready. Gently make a hole on the top side of each golgappa puri by cracking it in the center with a spoon or index finger. Take one serving plate and arrange them on it. 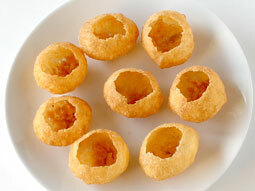 Fill each puri with 1-tablespoon potato and 1/2 tablespoon onion. Drizzle 1-teaspoon date tamarind chutney over potato. Drizzle 1/2 teaspoon green chutney over it. Drizzle 1/4 teaspoon garlic chutney over it. 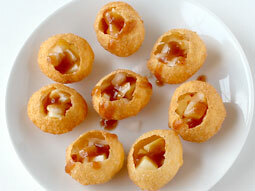 Pour 1-tablespoon curd over each puri. Sprinkle Sev over it and garnish with coriander leaves. 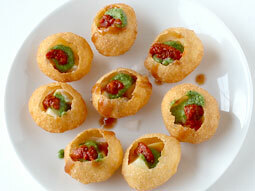 Dahi Puri Chaat is ready for serving. Serve it immediately. 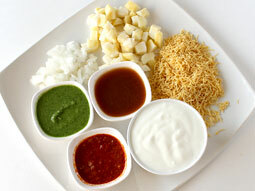 Feel free to adjust the amount of all chutneys and curd to get your desired taste. Add sprouted moong beans or boiled black chickpeas for variation. Prepare chutneys in advance and store in a refrigerator. Serving Ideas: Serve it as evening snack or as party snack in the kitty party. This seems very tasty. I love it. Can I just confirm, the onion is raw, uncooked when added? Thanks. Response: Yes Charles, raw onion is added. If you don't like it, you can just skip it. Awesome and easy and interesting recipes. Thank you sooo...much. 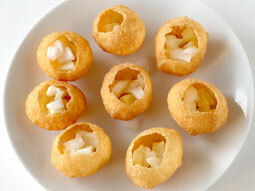 Dahi Puri has always been one of my favourite snacks! Especially on a hot summer’s day, this bite sized snack has always been welcomed at home. Gowardhan dahi provided me with the perfect flavours for this snack while at the same time helping ensure that I took care of my health. I can still indulge in my favourite dahi puri without adding tires around my waist haha! Thanks for the recipe. It helped a lot and I have to ask you to try beating the curd with sugar and seasoning it with chaat masala, trust me it tastes so good. Response: Thank you Asmita for trying the recipe and sharing the info. I will definitely try it. The recipes are amazing. Truly delicious with simple process and all ingredients are available. I want a recipe for flat puri that goes with papdi chat. Thanks. I really enjoyed eating it. It was an awesome dish and it's very easy. I would like to ask you to put more dishes like this so, we can eat delicious food like this.